Sharon Gang, Marketing and Communications Manager for the Capitol Visitor Center, describes her experience meeting Jimilu Mason, an American artist with works on display at the U.S. Capitol building. Two new bookmarks I worked on for the Capitol Visitor Center (CVC) celebrate Constantino Brumidi, the artist who painted the Apotheosis of Washington in the eye of the Capitol Rotunda and murals throughout the Capitol. I brought a few to my Mom, who is an accomplished artist, and encouraged her to share them with friends. Mom shared the bookmarks with her friend Lois, who went on to share them with a friend. In a perfect example of the saying that the world is a very small place, it turned out that Lois' friend was Jimilu Mason, who sculpted the bust of Brumidi that is on display in the Brumidi Corridors on the Senate side of the Capitol. And, according to my mother, Jimilu was not happy when she saw that she hadn't gotten a credit on either of the Brumidi bookmarks. I met Jimilu one Saturday to apologize for our oversight and to give her several copies of the CVC's new Brumidi brochure, which credited her with the sculpture. At 82, Jimilu has had a long and successful career as a sculptor. Her work is represented in public and private collections around the world. In addition to the bust of Brumidi, Jimilu sculpted the bust of Lyndon Johnson in the Senate's Vice Presidential Bust Collection in the Capitol, and she created the bust of U.S. Chief Justice Frederick M. Vinson in the Supreme Court's collection. Jimilu works on the bust of U.S. Chief Justice Frederick M. Vinson. Jimilu prefers to work from life, but when necessary, as with Brumidi, she works from photographs and drawings of the subject. One of her most interesting subjects was Johnson who sat for her numerous times at the White House and at his ranch in Texas. "LBJ was at his best when he had someone in the room to engage with in conversation. Otherwise his expression dropped. Sometimes sittings would be 10 minutes, sometimes longer. One time he called and said 'I'm leaving for the ranch -- could you come down and bring the bust with you?' So I arranged to have the work taken to the airport and put on the President's plane. In flight, Johnson said, 'OK, I'm ready to sit.' I laughed and said, 'Mr. President, I can't work in an airplane!' He saw my point and sat for me at the ranch where things were a lot more relaxed." 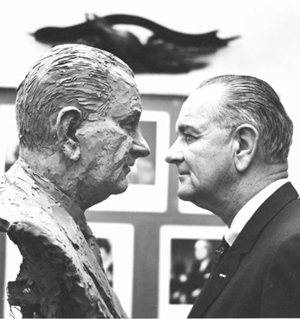 President Johnson examines his likeness "nose to nose." Jimilu feels that a piece of sculpture needs to stimulate a conversation with the viewer, and if it doesn't, it's not successful. "I'm always delighted when the response to one of my sculptures is favorable, and I know that the response to LBJ has been. I've actually seen people carry on conversations with the LBJ bust, and that's what you want to achieve. Otherwise, it is just a dead piece of bronze or stone." Jimilu's current project is a memorial to the victims of the September 11 attacks. It was a thrill to meet Jimilu, and I loved hearing her stories about creating her art. As a political junkie, I was especially impressed with her interactions with President Johnson. She made him seem very human and real, and I was honored that she shared these personal anecdotes with me. Thanks for sharing this story! Jimilu (Mimi) Mason is my Aunt.